There is a big hooplah in this industry about outing companies for things they are doing wrong. No matter where you are on that spectrum, I ask: Why not stop being negative overall? Stop telling people what they are doing wrong and start "outing" the companies that are doing things right. I challenge all of you reading this today to think of a site that "gets it" and tell the world. Send some link equity their way and set the bar for other websites. But more importantly, we can learn from what others do well, not just from what others do wrong. 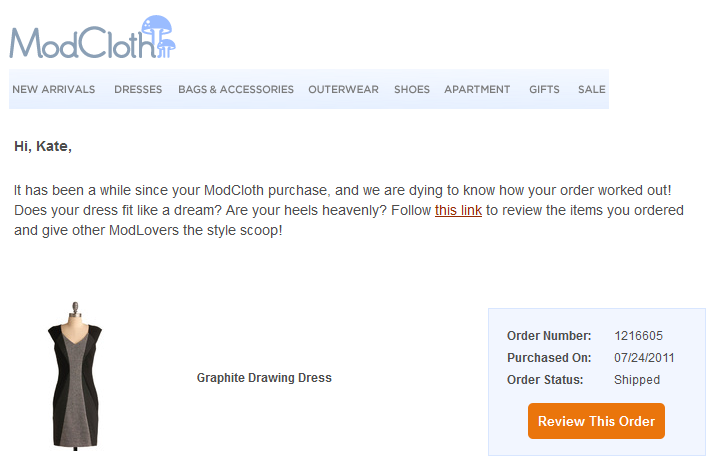 My entry is ModCloth, a online vintage and retro clothing retailer started by high school sweethearts. It's not their clothing that keeps me coming back, it's the whole business from start to finish. They have great products, even better customer service, and their community really is what makes their business. Here is what I think sets them apart. 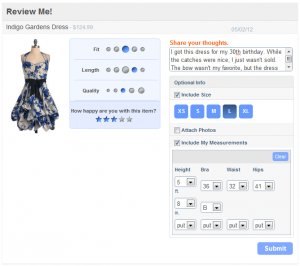 Reviews have become the cornerstone to most eCommerce websites. They are a multifunctional part of any product page. 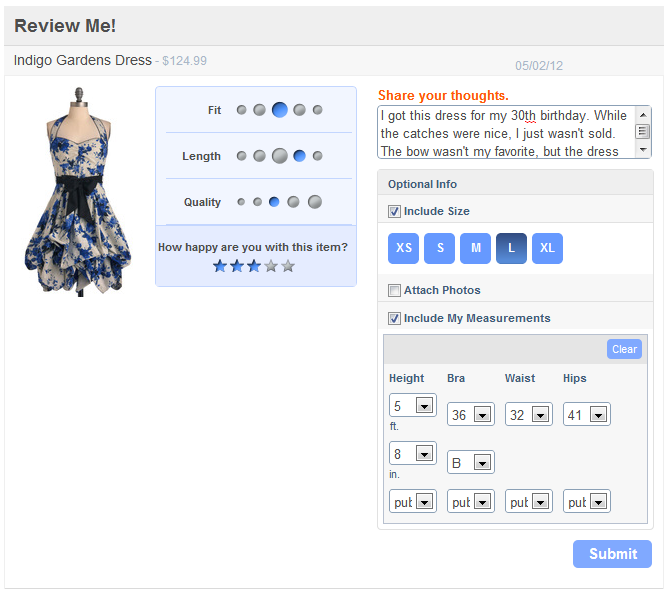 They add unique content to the page and give shoppers insights to the products they are considering. 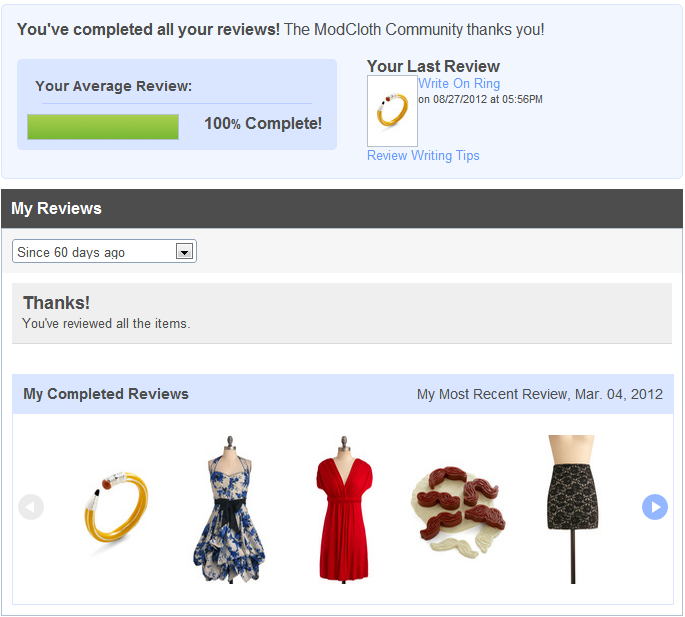 I've written about this before, but Modcloth does a fantastic job with their reviews on a few levels. Every time I buy something at ModCloth, I get an email a week or two later asking how I liked it, etc. It reminds me to leave a review after I've had some time to wear, try on, and maybe return an item. Now the actual reviews are really what make them stand apart from the rest. They ask for but do not require the sizes of product purchased, the measurements of the buyer and any images they might want to share. This makes for amazingly unique reviews. If you shop online and have bought clothes based on reviews before you know that a piece of clothing fits differently depending on the person. If someone leaves the comment that the dress is short but they are 6' 1" (tall for a girl), then you take that into account. Small on top? How big is she? This is how you make a difference online. NOT by copying what ModCloth is doing, but by asking what your users need, want and desire to make their purchase process better. How does this translate to better search results? Popularity, links, and all of that, but you also have people that are enthusiastically leaving comments on your items. You aren't paying for that content. It just happens. 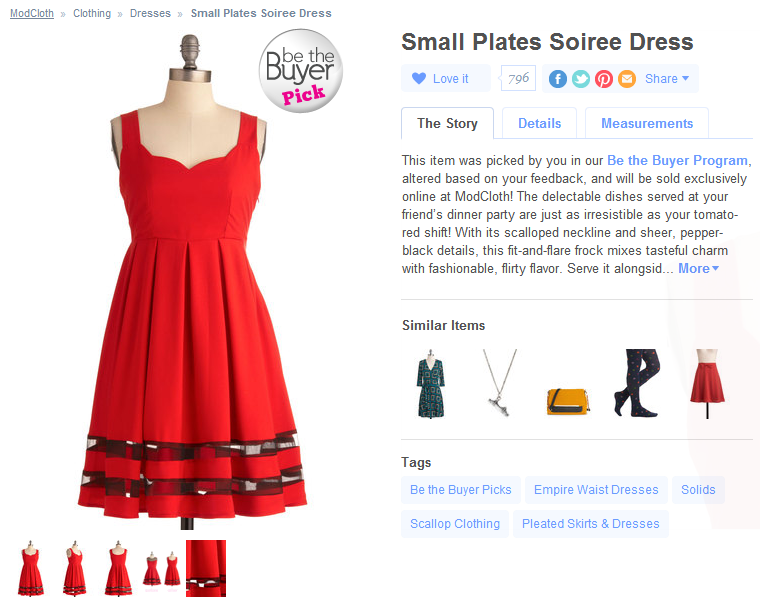 I can only imagine what ModCloth's long tail traffic looks like. 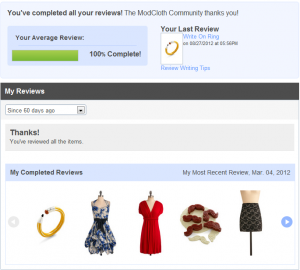 This is rather common today with Twitter, but something else I do love about ModCloth is their personal responses to reviews. I don't know the whole process here as I have never had a bad experience, but just the fact that someone with a name (Katie in this case) responded with a next step is more than most companies do. I'll talk a little more about their community later, but this was specific to reviews. 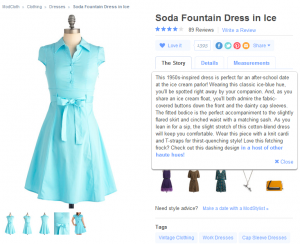 This 1950s-inspired dress is perfect for an after-school date at the ice cream parlor! Wearing this classic ice-blue hue, you'll be spotted right away by your companion. And, as you share an ice cream float, you'll both admire the fabric-covered buttons down the front and the dainty cap sleeves. The fitted bodice is the perfect accompaniment to the slightly flared skirt and cinched waist with a matching sash. As you lean in for a sip, the slight stretch of this cotton-blend dress will keep you comfortable. Wear this piece with a knit cardi and T-straps for thirst-quenching style! Love this fetching frock? Check out this dashing design in a host of other haute hues! The best part of it all? Their dedication to their community. I mentioned their responses to reviews but they do so much more. Their social interaction is above and beyond, but more than that, they talk to their customers. I have proof of at least three times where they have interacted with me, didn't bother me, and taken the feedback into action. The other thing I have caught them doing is surveys, and there have been two types. Unobtrusive quick surveys like the one below are placed in the site, not through a pop up and just asks a few questions before a thank you and return to the shopping process. That's it! 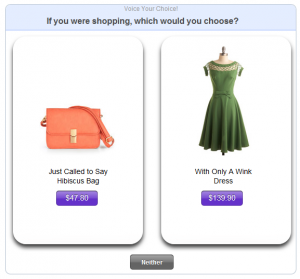 A simple question and then I moved on with my shopping process. No 10 questions about the store, or my shopping process (even though I wasn't done). Just a question about "would you buy this?" Though my favorite was a one-on-one focus interview. I responded, naturally as a marketer, to the request for an interview (the ask was made on Facebook if I remember right) and the process was fantastic. I was contacted via email and we set up the interview. It was explained to me that it would take an hour and in return I'd get a $40 gift certificate. I won't divulge what it was about, but they have implemented the changes I was asked about and all my feedback was taken into account from what I can tell. Notice I didn't add anything in here about title tags, percentage of keywords used on the page, or link building. Those are all just singular tactics. A colleague recently wrote a post over at SEOmoz called "Guest Blogging - Enough is Enough" and it gets to the point that one tactic like guest posting (while an effective tactic) is not going to grow your traffic or rankings. It's the combination of all marketing facets that will grow your brand, domain authority, traffic and in the end, SALES. ModCloth puts together a number of things but the defining part of every aspect I covered was that it was built for the community. The ultimate takeaway should be to think not of metrics like ranking and traffic, but conversions and engagement. Talk to your customers more and test their feedback. As online marketers, we are not the perfect customers, but I am sure you have some willing to give you feedback on your site and products. All you have to do is ask. 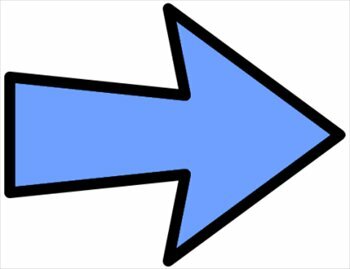 To other internet marketers, who are you going to "out" next? To webmasters, what do you want to learn from your customers? How do you plan to ask?